As the son of an alcoholic, I have experienced the damage alcohol can do. I felt obliged to cover my guilt with some fig leaf by offering some modest caution to my readers. I did it with a single sentence on page 3, at the conclusion to the book's first section: "Drinking". Subsequently, the issues of harm, health and danger appeared (see Healthy whisky and Bam Bam whisky, for example), but every sentence hinting at any deleterious impact of alcohol consumption was, by the demand of individual distillers and the industry, refused publication. As compensation, the publisher offered me the opportunity to compose a single but prominent statement to be signed by writer and publisher together. 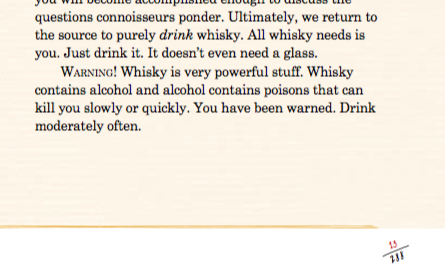 I wrote it, but the publisher recast it in such a way as to reinforce, rather than caution against, drinking. For a short while that stood, but the industry liaison was uncomfortable even with this broken down version—and so was I—and ultimately no warning at all was published. Whisky is the golden-lipped femme fatale of the spirits world. Drunk too swiftly, it can kill you quickly; drunk too often it can kill you slowly. Don’t waste your health on poor whisky: drink the best and drink it moderately often.